We are closing in on Easter so I thought I should make something eggy and spring-like relevant for the season. 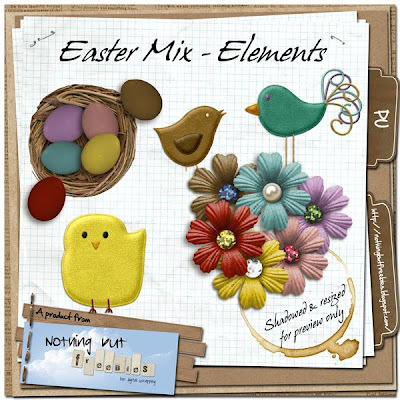 Here is a mix of elements for you. Tomorrow is a big day here in Denmark. The Royal Twins are being baptised so I will be glued to the TV all day to see everything and wait with anticipation for the names to be announced (all 8 of them!). So don’t count on any post tomorrow. I will, however, be back with “A Little Bit” for you on Friday. Thanks so much for the Easter goodies. That chick is super cute - thanks! Thanks so much! This is so cute for Easter! Hey, thank you! These are very cute for dressing up my spring time photos. thank you for the super Easter freebies! let us know the names! This is very sweet. Thank you!